Launch a modern, with a convenient interface online tolls shop using Buidex theme. You will be able to display tools by categories and brands, inform about special offers and discounts with this theme. You will customize your eCommerce website according to your purposes and vision using a strong Jet plugins toolkit for Elementor page builder. With a great mix of WooCommerce and JetWooBuilder plugins you will create WooCommerce page templates and showcase products and their taxonomies easily and quickly. Using JetProductGallery plugin you will present images of the products in the form of stylish galleries. JetSmartFilters plugin will allow filtering products using AJAX filters on the pages. You will create comparison lists and wishlists and enable visitors to add desired products into them, showcasing the selected products with this plugin in the most amazing way. JetElements plugin will provide a lot of useful widgets, which will help to enrich the content. JetMenu plugin will be a greater helper by building mega menus with drop-down sections. 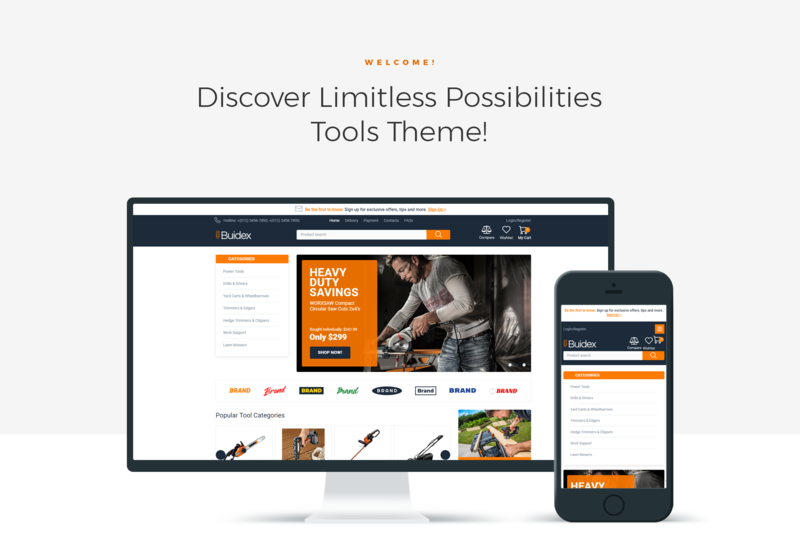 Boost the popularity of your tools store and attract more customers with a responsive Buidex theme.